The original recipe I followed doesn’t call for chilling the dough, but I feel with any biscuit or pastry dough giving it time to firm up in the fridge makes rolling it out much easier. Also, although I made these by hand – lazily not wanting to whack out and consequently have to clean my food processor – if you have one it does make the process a lot easier. Rubbing together the butter and flour until it reaches a breadcrumb consistency can take quite a bit of time and can be accomplished by just a few pulses. Always finish combining your dough by hand though, so only pulse a few mores times after adding your egg yolks, and once a ball begins to form dump it onto your work surface to bring the though together yourself. I filled my cookies with Lemon curd (the preferred flavour in my house) and a ‘Christmas’ jam I’d picked up a couple of months ago in Devon, but they can be filled with any jam or curd you like (raspberry jam is particularly popular). If you are going to do see through cut out cookies I would pick a jam over a creamy filling to get that stained glass window effect. 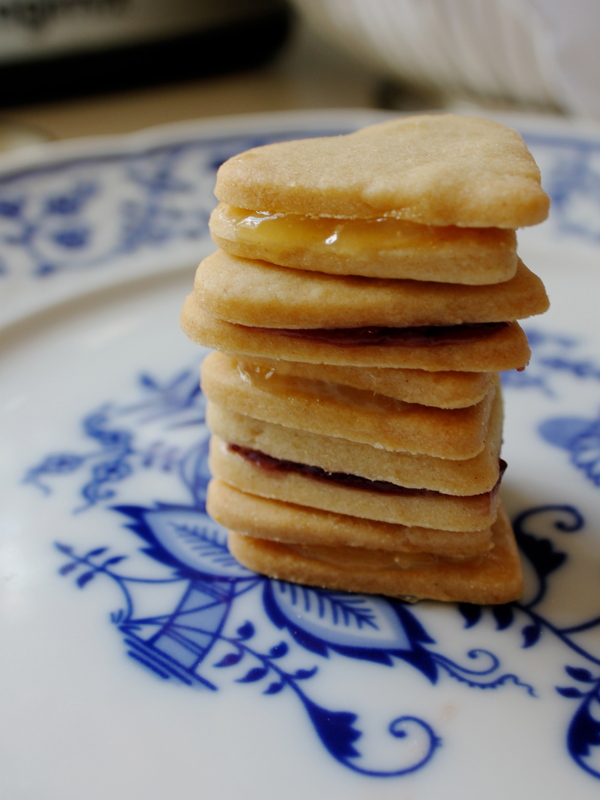 Of course you can just make regular sandwich cookies like the mini ones I’ve done above and fill them with any kind of filling that takes your fancy (think chocolate ganache or a flavoured butter cream mmm yummy). The cut out effect is really just stolen from traditional linzer cookies, which are similar to these but often have ground almonds and cinnamon incorporated in the dough and are dusted with icing sugar before serving – Joy of Baking has a great recipe if that sounds like something you’d like to try! 1. Preheat the oven to 170° Celsius or 325° Fahrenheit (if using a fan assisted oven, which mine is, you lower the heat by 20 degrees, so I baked my cookies at 150°). 2. In a large mixing bowl (or your food processor) add the flour, sugar, salt and cold butter. Using the pads of your fingers rub the butter into the flour mixture until its slightly worked in, then start rubbing the mixture between your whole palms until it resembles breadcrumbs. 3. Add the egg yolks, grated zest and vanilla extract, use a large wooden spoon or spatula to start bringing it together before getting your hands in there to form a roundish disk of dough. Wrap the dough in cling film and pop it in the fridge for at least 30 minutes (but you could leave it in there for at least 24 hours). 4. Once your dough has chilled, liberally flour your work surface, the top of the dough and your rolling pin, then roll it out to about half a centimetre thickness. Using whatever shape cookie cutter you like cut out as many biscuits as you can, then divide the biscuits by half and using a smaller sized cookie cutter in the same shape make a hole in those biscuits. 5. Place them on a lined baking sheet (I had no parchment paper so used foil sprayed with a bit of canola oil) and bake the biscuits for 10-12 minutes or until a light golden brown. Leave them to cool on the baking sheets for a few minutes before removing them to cool completely on a wire rack. 6. Using a small off set spatula or butter knife spread a small amount of the jam or curd on the biscuits, sandwiching them together. 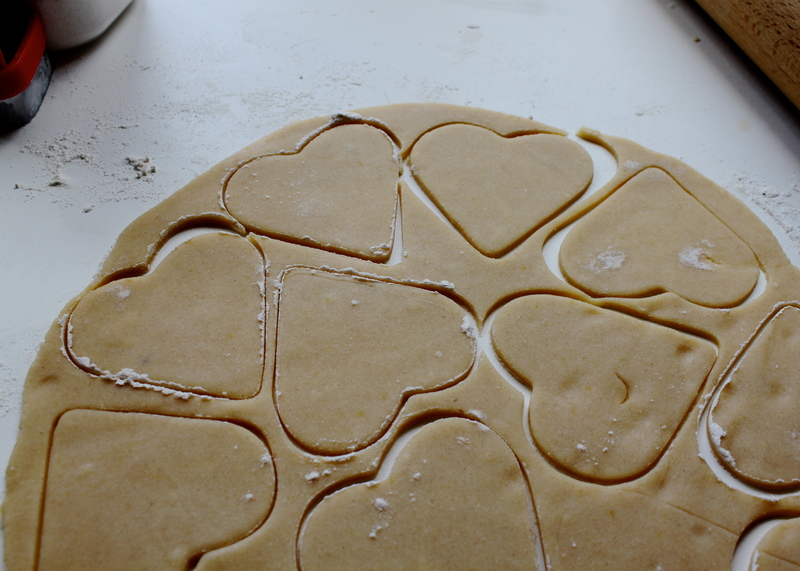 I had to throw away a few biscuits (by throw away, I do mean eat) as I couldn’t find matches for all the biscuits – but taking a little bit more time and care than I did when cutting out and placing your biscuits on the baking sheet should take care of that problem! The biscuits will last for a couple of days in an air tight container but are best on the day they are baked, as they will slowly start the loose their crispness – though I think they are just as delicious soft! Oh gosh that rocks! Did you hear that loud “clank” sound? That was me jamming my thumb as I tried to reach into my computer monitor to sample one of those jam-filled cookies! Thanks for sacrificing your dissertation work just to fill out minds with dancing cookies. haha it was my pleasure! Probably not the wisest decision I’ve ever made but a very delicious one – trying the opposite today by motivating myself with the promise of mac & cheese if I finish the damn thing by tonight!